Iceland is one of the best places in the world to see colorful lights dancing in the night sky. 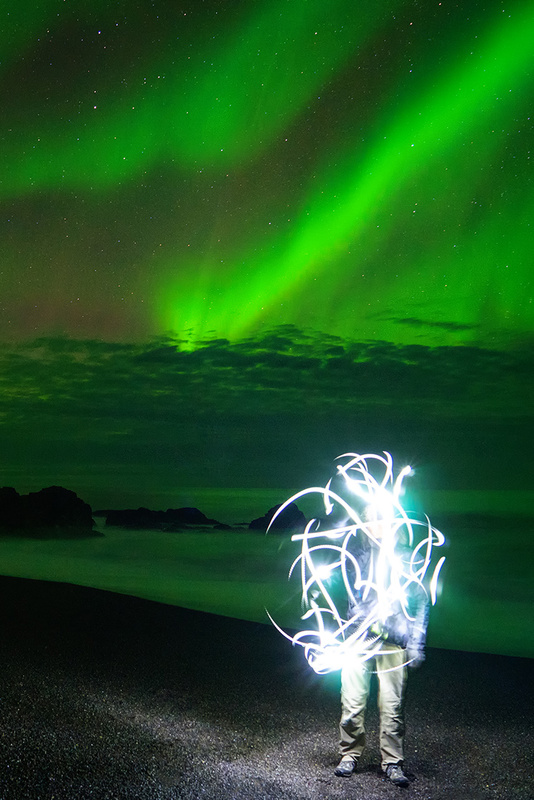 Learn how to find & photograph the amazing Northern Lights in Iceland. Before I visited Iceland, I’d only witnessed the northern lights one other time back in college. The northern lights transfixed me for hours, watching this mysterious green glow of the magical aurora borealis dance over a high mountain range in Montana. So trying to locate and take amazing photos of the northern lights in Iceland was a top priority for me — as it often is for many visitors to the country. However many people don’t realize that this incredible phenomenon is elusive and unpredictable. Yes, even in a famous northern lights country like Iceland. So to help you improve your chances for finding the northern lights, I wanted to share a few tips and photography techniques from my recent adventure in Iceland — and show you how I managed to get some great photos of this incredible natural phenomenon. So why are the northern lights so difficult to see, even in Iceland? Well, it’s because there are many different factors involved. For a perfect northern lights experience, you need a combination of dark skies, clear weather, and strong aurora activity. Ensuring that all these requirements come together takes some planning. For the same reason star-gazing is better when it’s dark out, viewing the northern lights is best in the dark too. Light pollution from cities & towns hinders the experience. 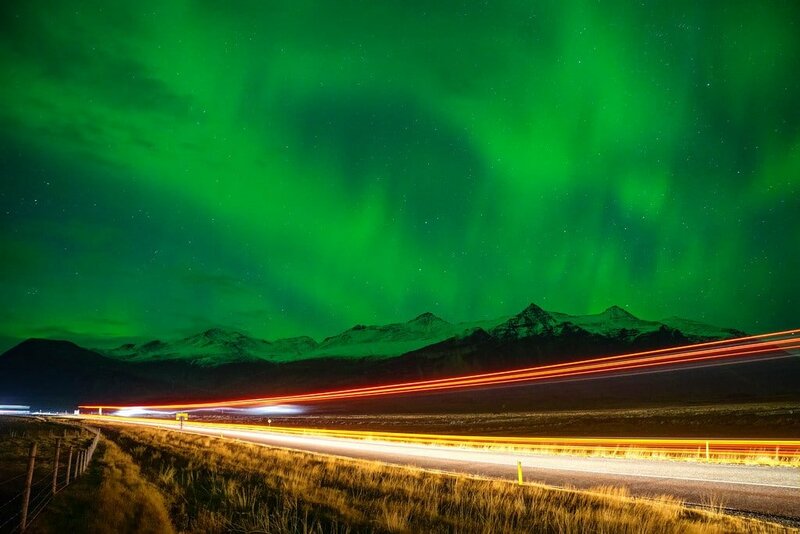 Yes, you can sometimes see the lights from Iceland’s capital city of Reykjavik. However you’ll have more luck in the countryside away from man-made light sources. If the weather is overly cloudy, you won’t be able to find the northern lights. So pay attention to the weather forecast, especially cloud cover (infrared satellite maps help a lot). While you might still see some aurora lights if it’s only partly cloudy, you’ll have the best chance when there are no clouds at all. Check out cloud cover conditions around the world on MeteoStar. Because aurora activity comes down from the sun in space, scientists are able to predict how strong it will be by looking at our sun’s solar wind, and the strength of the Earth’s magnetic field. The KP-Index ranges from 0-9 with ratings of 5 or greater considered solar storms. There are a few websites and apps that specifically track it. Iceland has a great site that predicts both cloud cover & aurora activity. Even better, the Aurora App will give you push notifications on your phone when there’s a good chance too see the lights (along with forecasting tools). For worldwide aurora predictions, check out Space Weather Ovation too. 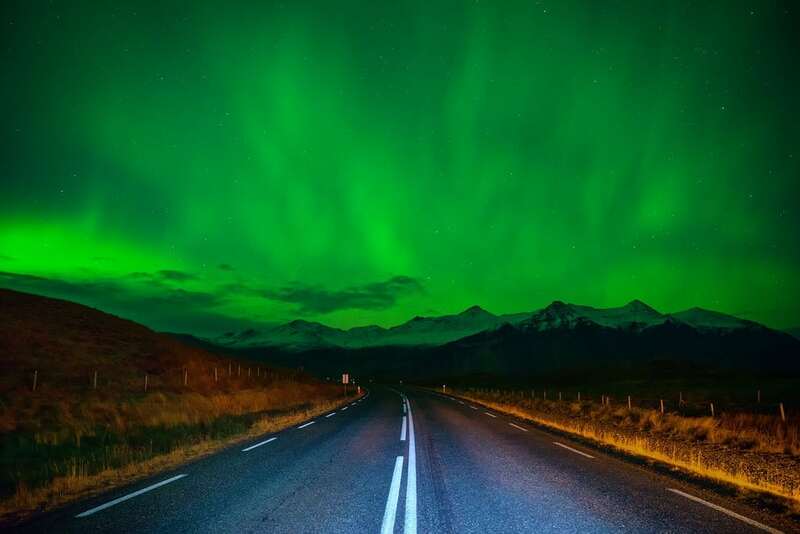 You should be able to go hunting for the northern lights on your own by renting a car in Iceland. 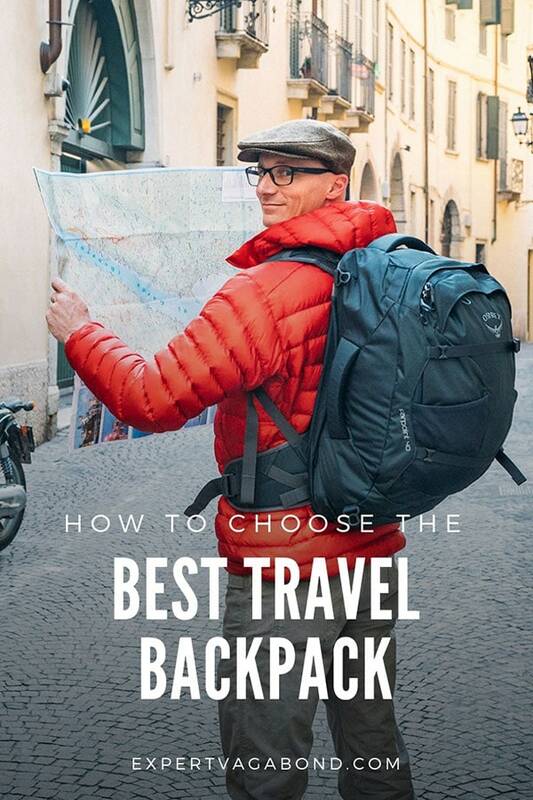 Another option is renting a camper van, which allows you to get far away from towns and their street-light pollution. Experience driving in snow is helpful if you’re visiting Iceland in the winter, as conditions can sometimes be very harsh. Big snowstorms are common. I prefer exploring on my own, as it gives me the freedom to stay out all night or move locations on a whim. However if you don’t feel comfortable driving in Iceland at night, there are plenty of organized northern lights tours available too. 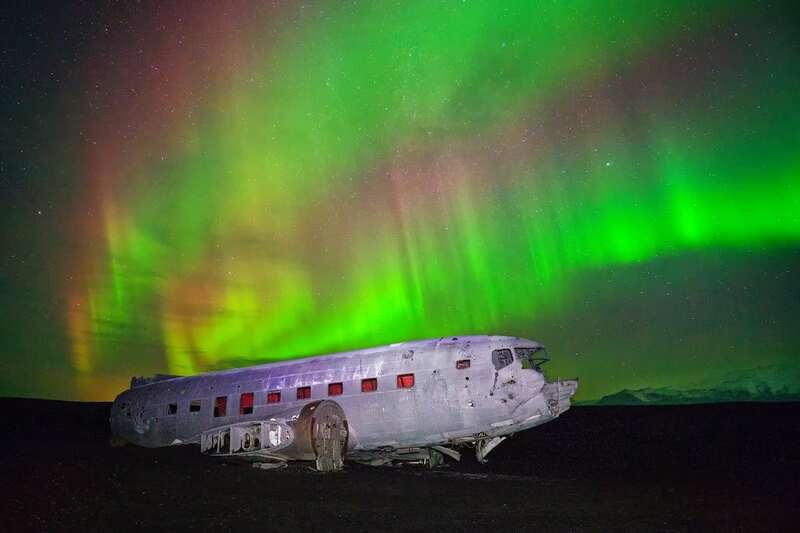 The best season to see the northern lights in Iceland is the fall/winter months from September to April. The absolute darkest months in Iceland are between November & February, but these months can also have the worst weather. Remember that you need a combination of darkness away from towns, clear skies, and strong aurora activity to see the northern lights. Witnessing Iceland’s northern lights during summer months is pretty rare, due to almost 20 hours of sunlight per day near the arctic circle. 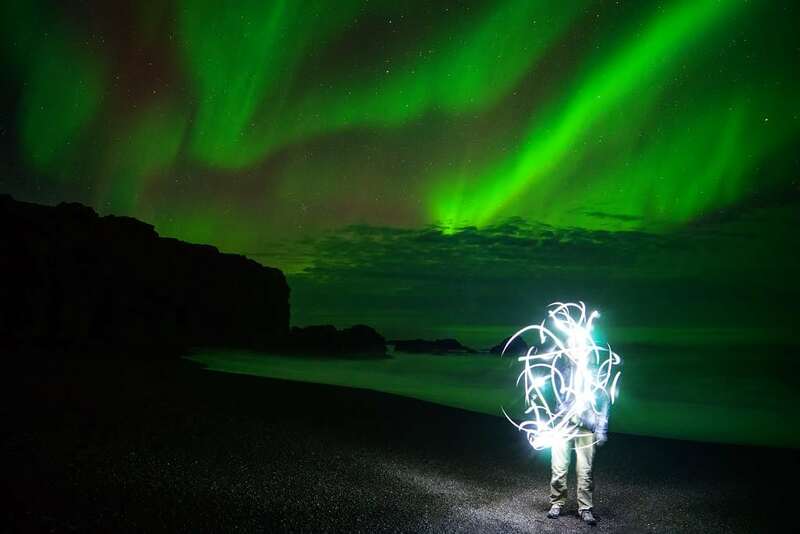 The more time you spend in Iceland, the better your chances are of spotting the lights. If you’re only visiting on a 2 day stopover, you’ll need a LOT of luck to see them. I recommend spending at least 7 days in Iceland if you want to find the northern lights. Even then it can be difficult. As an example, my photographer friend Ken Kaminesky has visited Iceland 5 times now and has still never seen them! 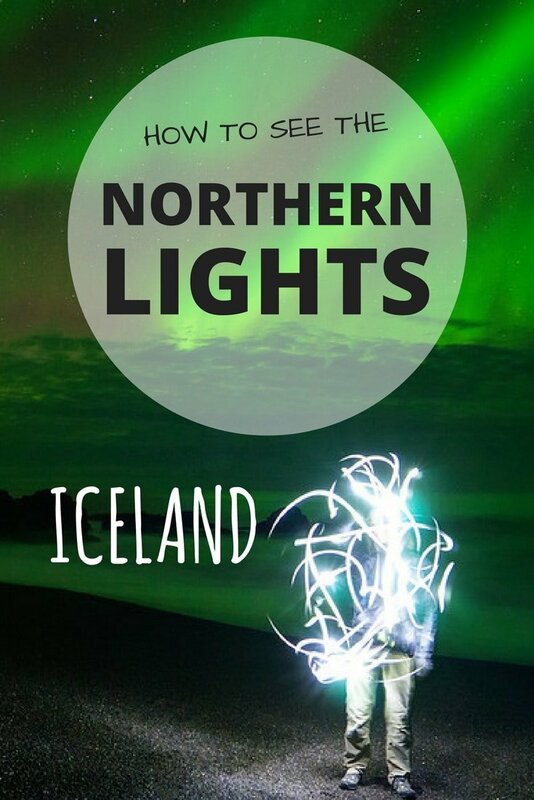 You also won’t see the northern lights if you’re bar hopping in Reykjavik. A primary reason why I was able to capture such great photos of the aurora borealis is because I stayed outside all night, for multiple nights, driving around searching for them. It takes some dedication. Ok, a few more tips for finding the northern lights. While it may seem obvious, remember to look North! The lights dance along the magnetic bands of the arctic circle, so you need to keep your eyes North to see them. Often the lights start off weak at first, slowly increasing in intensity. Weak aurora activity will look grey to the naked eye. Much like wispy clouds or fog moving in the wind. They can be easy to miss. Aim your camera at the grey stuff and shoot a long-exposure photo (20 seconds or so). If those “clouds” come out green in your image, they aren’t clouds! You’re witnessing a weaker version of the northern lights. The stronger the aurora activity, the brighter the colors will be. The most common northern lights color you’ll see is green. However if you’re lucky, they can also be blue, red, and orange depending on which atmospheric gasses happen to be prevalent. Once you find the aurora, capturing decent images of it is a whole new challenge. Here are some tips to help you photograph the northern lights in Iceland. In most photography situations, the quality of your gear doesn’t matter too much. However for northern lights & star photography it does. Here’s a list of recommended gear you’ll want to produce some great low-light shots. You’ll want a quality camera (brand doesn’t matter) with a large sensor for minimal noise at high ISO settings. A wide angle lens aids in photographing large landscapes with the night sky. A fast aperture allows the maximum amount of ambient light to enter your lens. Sturdy travel tripods let you shoot long exposures without producing camera shake. Extra batteries give you flexibility to stay out all night waiting for peak activity — plus cold weather drains them faster. Even with the best camera gear and knowledge of the optimal settings, without proper focus, your northern lights photos won’t come out crisp/clear. There are a few different methods to for focusing your camera at night, but my favorite is to focus on a distant landmark (like mountains) on the horizon. This is easier to do around sunset or blue hour with some daylight left in the sky. Most cameras have an infinity focus setting (∞), but it’s not always accurate. Zoom in as much as possible and adjust the focus manually. Once you have it locked in, remember to keep “auto focus” off and don’t touch the focus ring. 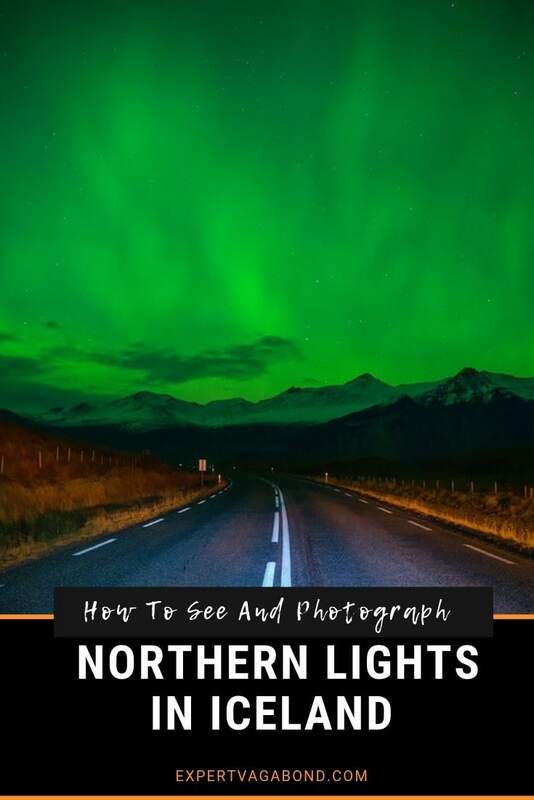 I’ve included my northern lights camera settings under each photo in this post to give you some examples. 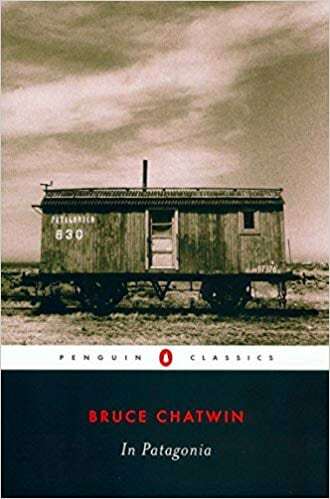 But generally, because the intensity of the light and amount of movement is constantly changing, you’ll have to experiment with settings throughout the night. Your camera should be set in Manual Mode, giving you the power to change each particular setting on it’s own. Most professional photographers shoot in RAW format rather than JPG, as it provides the maximum amount of information allowing for greater flexibility with post processing later. You want to capture as much light as possible, so use the widest (fastest) aperture your lens has. I used F4.0 in these photos, but F2.8 is even better if you have it. To learn more about aperture, click here. Depending on how fast the lights are moving, or how bright they are, you’ll want to adjust your shutter speed (exposure) accordingly. Anything from 10 seconds to 25 seconds is a good guess. The faster the lights are moving, the shorter the shutter speed should be. The last setting you should adjust for northern lights photos is ISO. Increasing ISO allows your sensor to capture more light. The downside is that the higher your ISO is, the more sensor noise you’ll get, resulting in a grainy image. Settings around 2000 – 4000 should work best. Once you have a decent image, you can enhance your Iceland northern lights photos with post processing software. I personally use Adobe Lightroom and Adobe Photoshop, but there are others. They all basically do the same things. How much processing you do is a matter of preference. Remember, art is subjective! You and I may not like the same things. 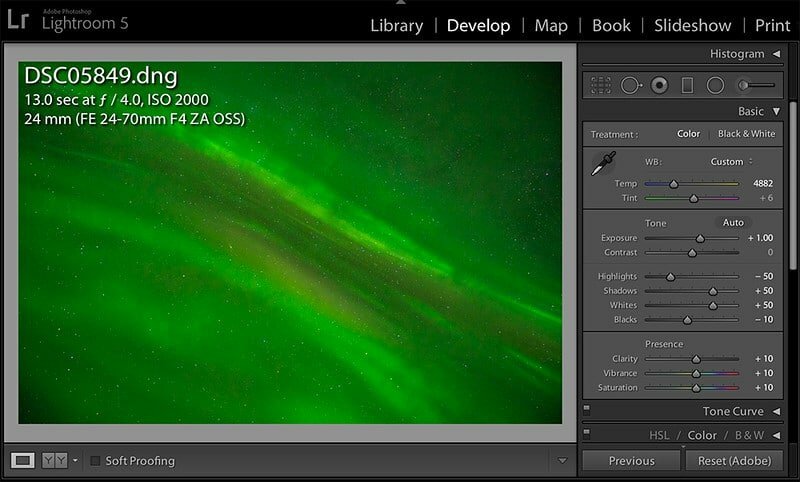 Post processing is a huge topic though, so I’ll just give you a super quick overview of what I did to enhance my northern lights images to really make them pop. My Iceland northern lights photography in this post was captured during late November over a 3 day window of clear skies and strong aurora activity as I drove around Iceland’s famous Ring Road. The lights would usually start off weak, increasing in intensity over the course of a few hours. The best shots were captured at peak aurora activity, which usually only lasted for about 10-15 minutes. Patience & dedication is soooo important for northern lights photography… you need to stick around long enough for the good stuff to present itself. With a little planning, a lot of waiting, and a dash of luck, you too can witness this amazing natural phenomenon in Iceland called the northern lights. Have any questions about the northern lights in Iceland? What about other suggestions? Drop me a message in the comments below!